The leaves are dropping, and the pumpkins and Halloween decorations are coming out in full swing. Here in the Smokies, we have some activities that will put a shiver down your spine and a smile on your face. 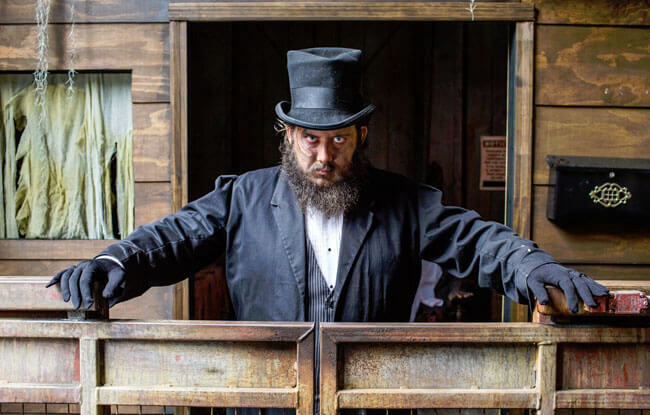 Whether you want to be scared or just want to watch other people’s reactions, you should visit this haunted house in Gatlinburg with over 10,000 square feet of “scare” space. The attraction is okay for most kids (Recommended for ages 10+, although ages 6+ can enter). Ripley’s also has its 18th annual Fright Nights on Fridays–Sundays in October starting at 6 p.m. with a character parade. The theme is “Movie Monster Madness,” with monsters spanning the last 85 years of movies. They are open year-round from 10 a.m. – 11 p.m. Sundays through Thursday, and 10 a.m. – 12 a.m. Friday and Saturday. If you plan to visit, grab the MobileBrochure.com coupon for 30% off logo items. Prove to others that you dared to visit! 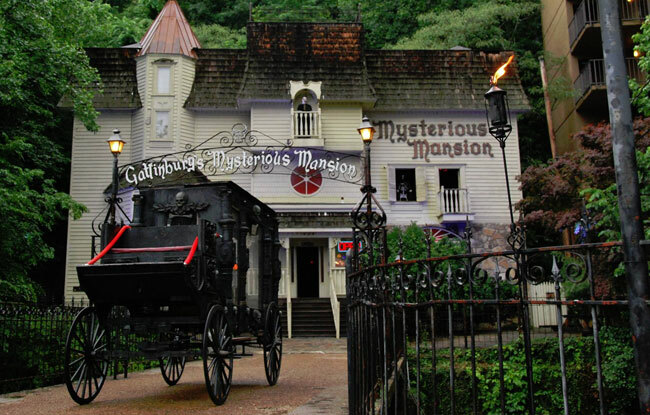 Experience a haunt like never before as you journey through three stories at Gatlinburg’s most haunted and mysterious mansion. Through October 31, 2016, every weekend hosts a more intense presentation for Halloween — House of the Macabre. The mansion is about a 15 – 20-minute self-guided tour (you are welcome to go at your own pace), and they are open daily. If you miss out in October, you can get creeped out any other time you might want to visit! If it is the off-season, just check with them to make sure they are operating. They adjust their hours depending on weather, maintenance, and slower business times. The brochure rack card will get you $1.00 off each adult admission. Visiting at night on this iconic attraction is the perfect way to see Gatlinburg as we get closer to Halloween. With the city all lit up, you’ll get a unique photo opportunity from the top. The Gatlinburg Sky Lift is open until 10 p.m. in October. If you want to see both day and night views, get their all day pass, which isn’t much more than a single trip. The GhostWalk is a nightly lantern-lit haunted history tour. Not so scary like a haunted house, but still creepy. You’ll learn about all the haunted hotels and buildings in the city of Gatlinburg as well as stories that will raise the hair on your neck. Make reservations online or by phone (423-743-9255) and arrive at the TGI Friday’s restaurant on the Parkway to start your tour. 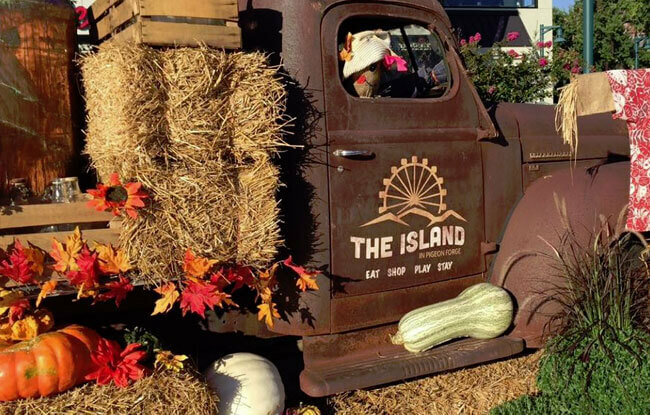 The Island gets into the spooky spirit with a carnival on October 29th from 5 p.m. – 9 p.m. 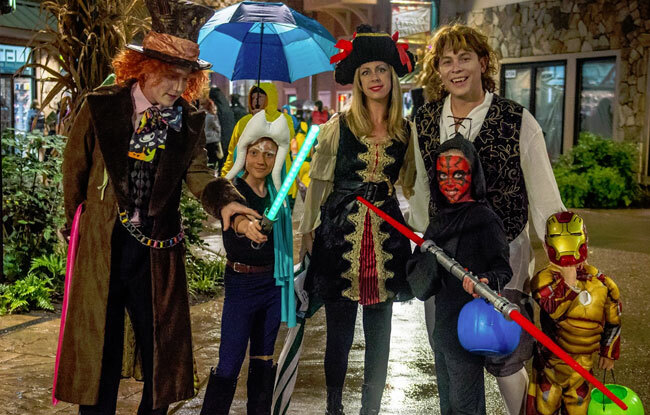 There will be trick-or-treating throughout The Island along with entertainment from circus acts. If you’re looking for the right event to dress up for, this is the perfect location. They are going to have a costume contest at 6:30 p.m. on the Ole Smoky Stage. If you plan to dress up, you’ll get half off all rides for the night. If you want to ride the Great Smoky Mountain Wheel and not be in costume and still want a discount, grab the coupon on MobileBrochure.com for $2.00 off. Enjoy a special Halloween show most nights in October. Performed by the Impossibilities duo Chris Collins and Erik Dobell, the mystery of the Weiss Manor is set to be solved in their presentation of “Wicked Things.” For a calendar of performances as well as purchasing tickets, please visit their reservation website. Every year on the Thursday before Halloween, the Pigeon Forge Community Center hosts a free (and little-kid-friendly) event. Visit vendors inside, and view interactive displays as they hand out candy. Perfect for all ages, Ripley’s Aquarium of the Smokies opens its door a little later for some fun for everyone. There will be inflatables, characters in costume, plenty of candy, and even a pumpkin carving contest! Visit the Karnival on October 31st, from 1 p.m. until 5 p.m.
We hoped you liked our list! The best thing about Gatlinburg and Pigeon Forge is most of the attractions on this list are not seasonal. If you’re ready to make your list of places to visit in Gatlinburg or Pigeon Forge, just make an account on MobileBrochure.com, activate it, and then login to save brochures to your suitcase. Wish to vacation in Mountains soon, we are retired on fixed income and look for best we can afford. Prices and traffic tend to go up especially with the fall colors in peak in October. If you can manage and have the flexibility of choosing times to go, weekdays are generally going to be less expensive. Renting a cabin can save you money on food as you can bring in supplies and cook there (plus, you can “bunk up” with multiple families and split the cost for even more savings). I’ve stayed in a cabin before and only left a few times to hike or visit neighboring locations like the Biltmore. There are plenty of locations offering coupons right here on MobileBrochure, so make sure you save them to your brochure suitcase, accessible here: https://www.mobilebrochure.com/suitcase/ (every brochure has a save button on them).